A creamy gel cleaner, conditioner and protector which cleans vinyl, rubber and plastic surfaces, including inflatable boats, whilst conditioning and protecting the material. 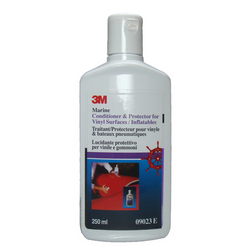 3M Marine Vinyl Cleaner, Conditioner and Protector is a creamy gel cleaner, conditioner and protector which cleans vinyl, rubber and plastic surfaces, including inflatable boats, whilst conditioning and protecting the material. The creamy gel is designed not to run off surfaces and will not leave a film or attract dust. The vinyl cleaner has added ultra violet inhibitors which helps to protect surfaces from the sun's damaging rays which can fade colour and cause rubber and plastic to harden and crack; this formula helps to prevent this damage occurring. 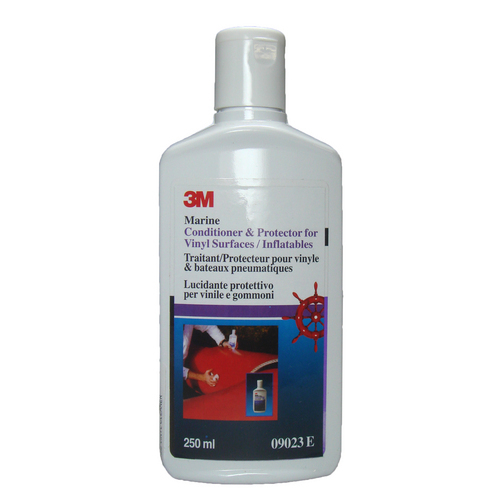 3M Marine Vinyl Cleaner, Conditioner and Protector can be applied by hand using a cloth and using a circular motion, working the gel into the surface. Turn cloth frequently and buff to a gloss.